Rear Corners allow for the fitting of most makes of Tow bar. This is a great advantage if you want to tow a trailer, caravan or some other load and still have some rear protection with stylish Chrome Look Stainless steel pipes. The price includes a Pair of Chunky tubular Rear Corner Bars for Nissan Qashqai 2007 to 2010 that fix to original mounting points. These are a NON DRILL product. Our Rear Bars and Steps are Hand Polished to a mirror finish. This product is totally NON DRILL and is supplied with all the fixing materials needed to fit the Nissan Rear Styling accessory to the vehicle. Excellent value for your Nissan Qashqai SUV 2WD & 4WD giving an excellent finishing touch. *** Note: Will not fit 2010 on Qashqai Models or Qashqai+2 versions. If in doubt feel free to contact our Sales Team who will be more than happy to assist! They look very good and are very easy to fit, certainly they are a nice finishing touch for our new car. 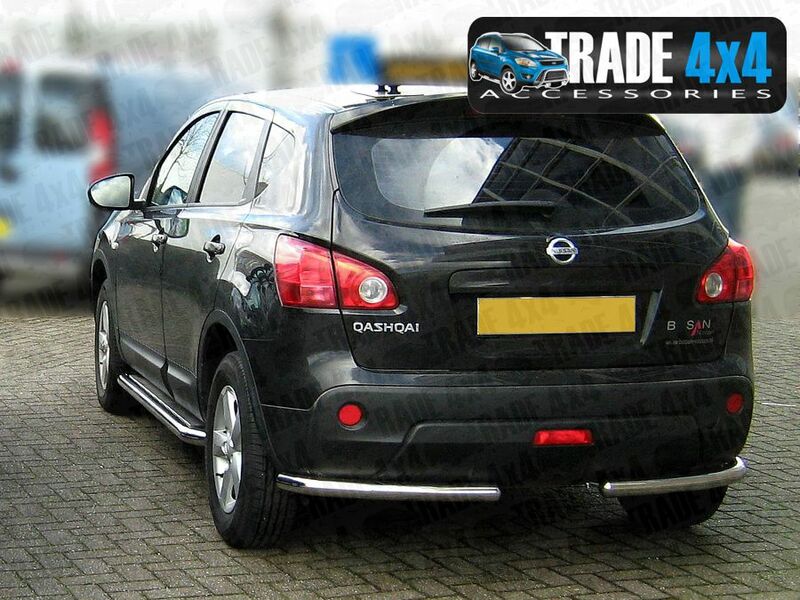 Click the button below to add the Nissan Qashqai Rear Corner Bars 60mm Chunky Tube 2007-2010 to your wish list.